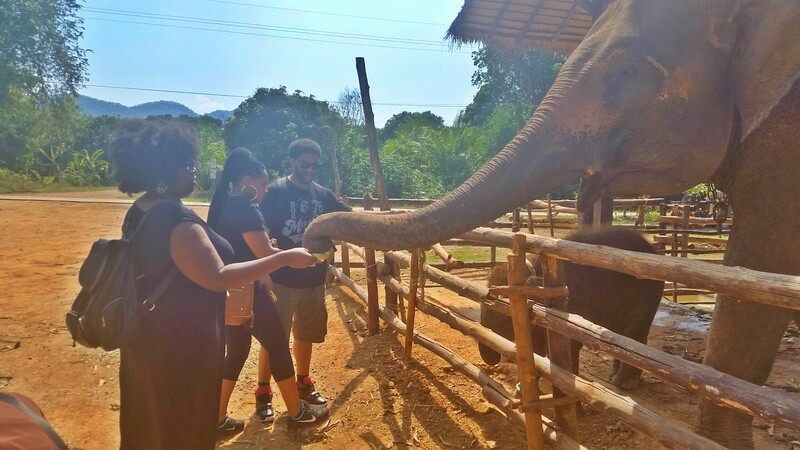 Thailand has so much to offer! I’d done a good amount of research prior to our trip and was adamant about planning a few excursions outside of the city. 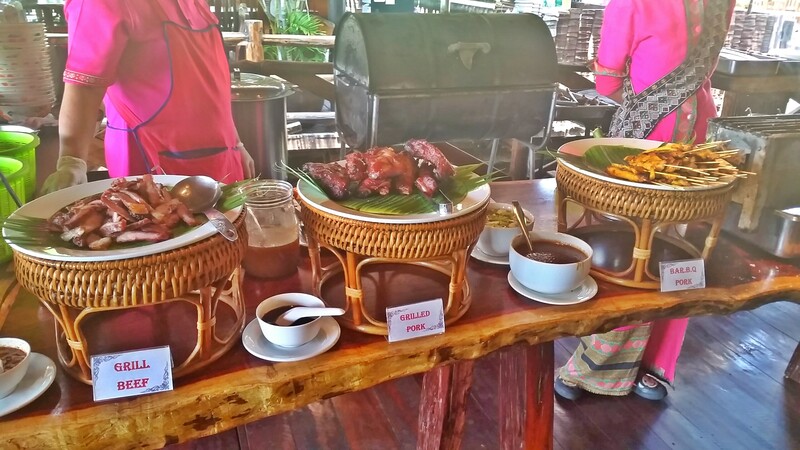 I really wanted to experience some of the great things that Thailand had to offer outside of Bangkok. There’s so much to do and see, and while I wanted to do and see everything, time just wouldn’t allow it. 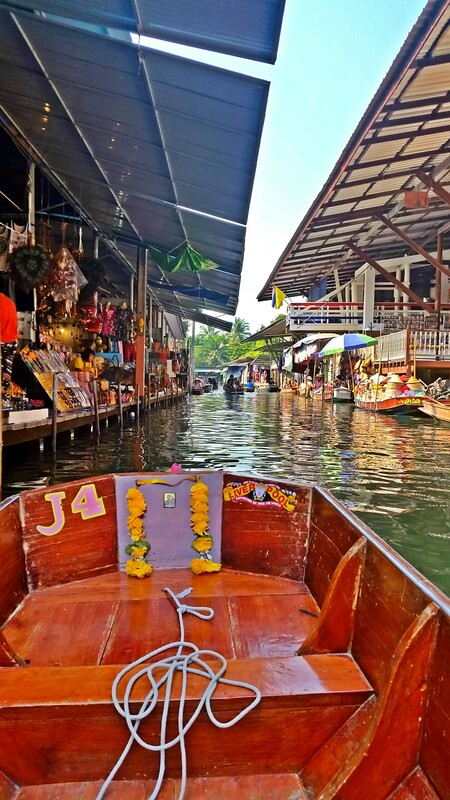 We decided on a full day tour that included the floating market, a tour of the war cemetery and bridge over the River Kwai, Tiger Temple and the elephant park. We had a lot of ground to cover for this full day tour, so we got an early start and was picked up from out hotel by our tour guide bright and early in the morning. 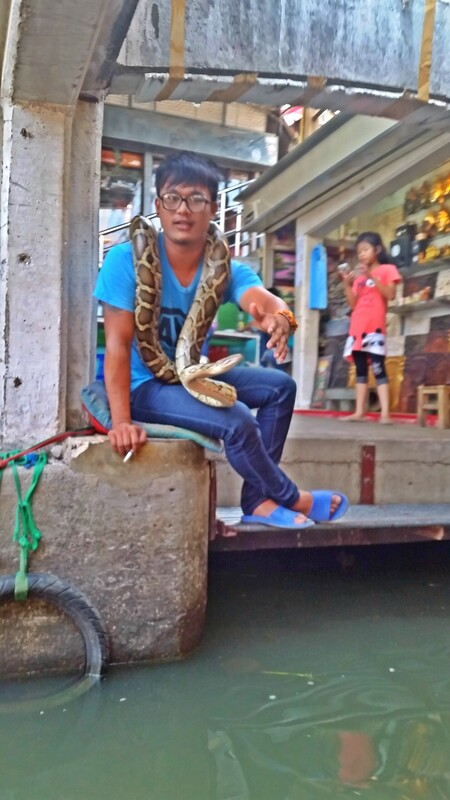 I absolutely love the Thai people. They are so proud of their culture and history. 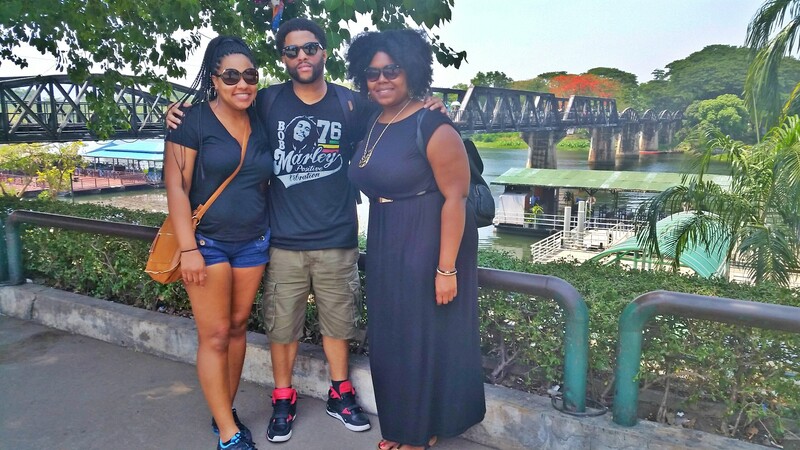 Our tour guide spent plenty of time filling us in on the ends and outs of Thailand. 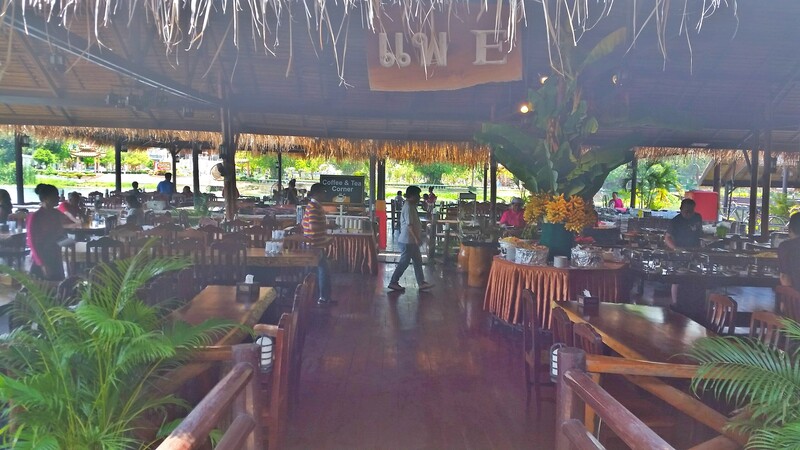 We took a two hour drive outside of Bangkok to the Damnoen Saduak district. 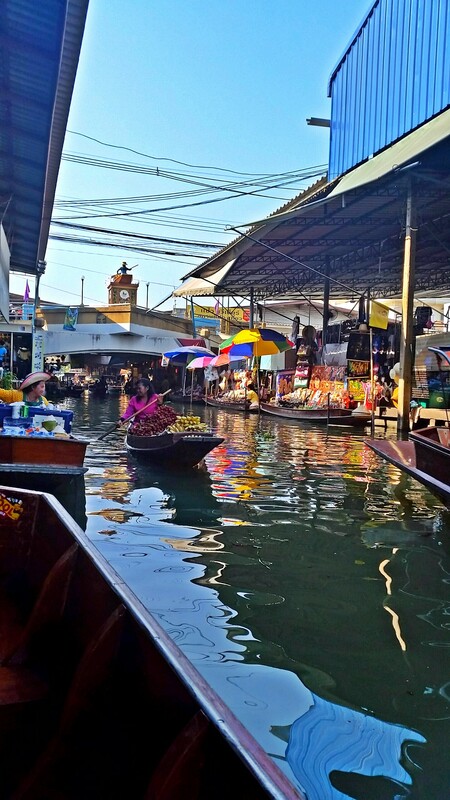 This area is known for its extremely long stretch of canals, which are mainly used for transportation, providing water to the local towns and villages, quality fruits and veggies, and of course tons of local vendors selling their traditional Thai goods. 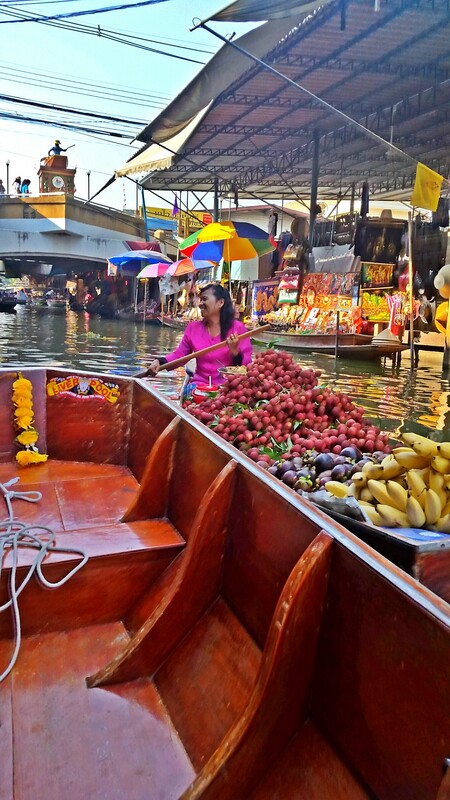 Once we arrived, we didn’t waste any time boarding a long tail boat and exploring the canal. 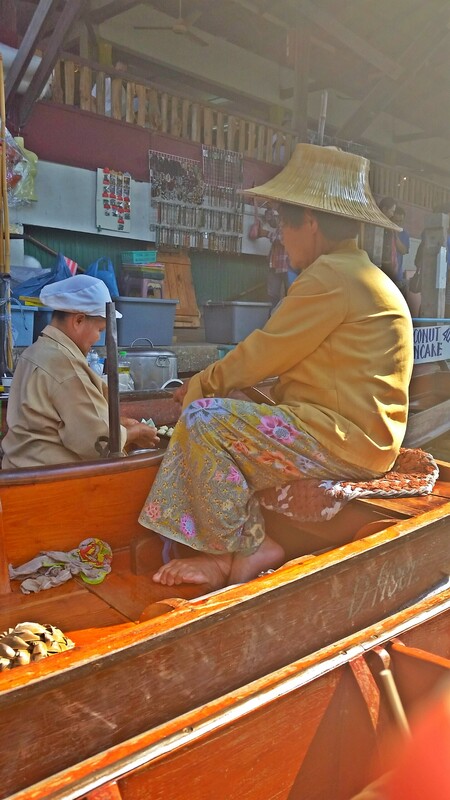 We stopped and purchased goods from several vendors and also purchased some fresh fried banana cakes. Needless to say, they were delicious. I was amazed at how all of this was taking place on the water. 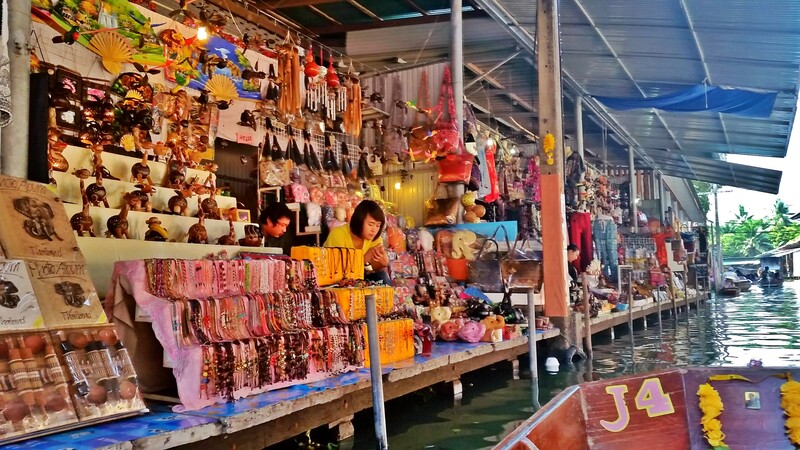 The floating market is one of the most interesting and unique markets I’ve ever visited. 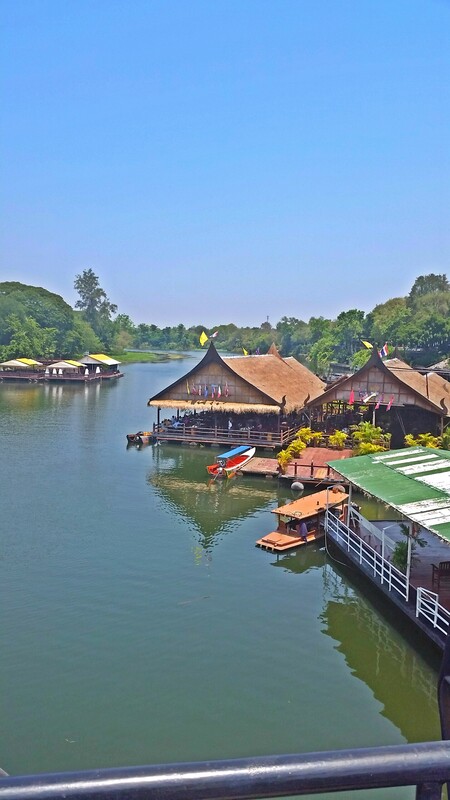 After our floating market tour, we set out to the bridge over the River Kwai, which was about another hour drive. 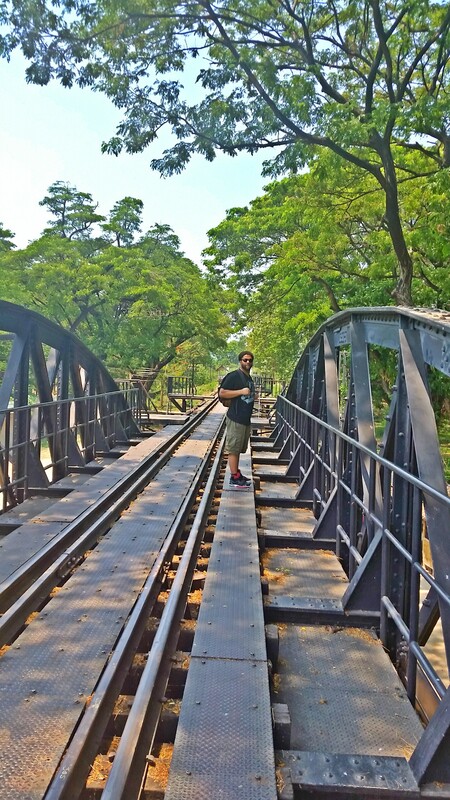 This bridge was built during World War II for the Japanese Army using Allied prisoners of war. Altogether, 61,700 British, American, Australian, Dutch and New Zealand soldiers and a large number of Chinese, Vietnamese, Japanese, Malaysian, Thai, Burmese and Indian laborers were involved in the construction of this bridge. 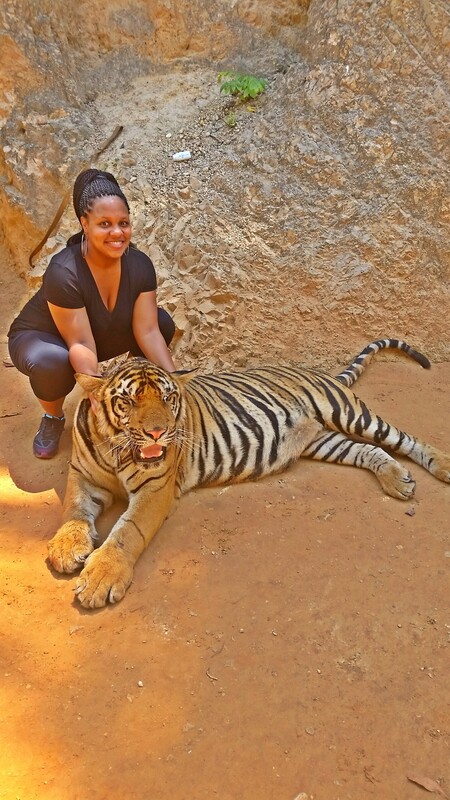 We wrapped up lunch and moved on to the Tiger Temple. 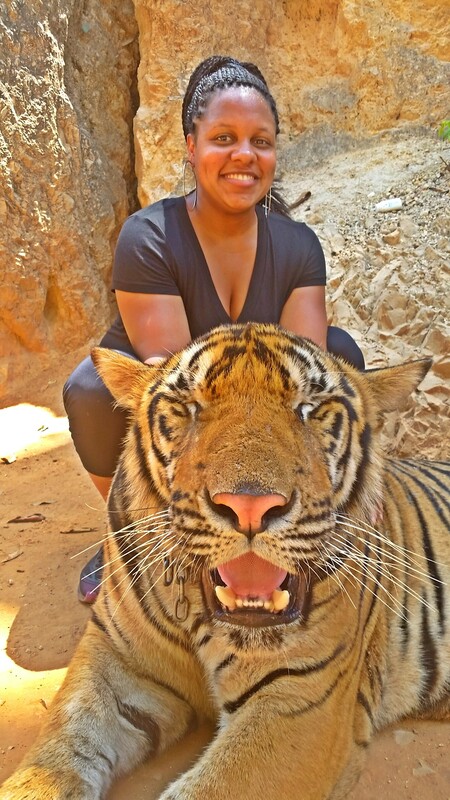 No lie, I was extremely nervous…hell, down right scared, but I was ready to fight my fears and interact with the tigers. 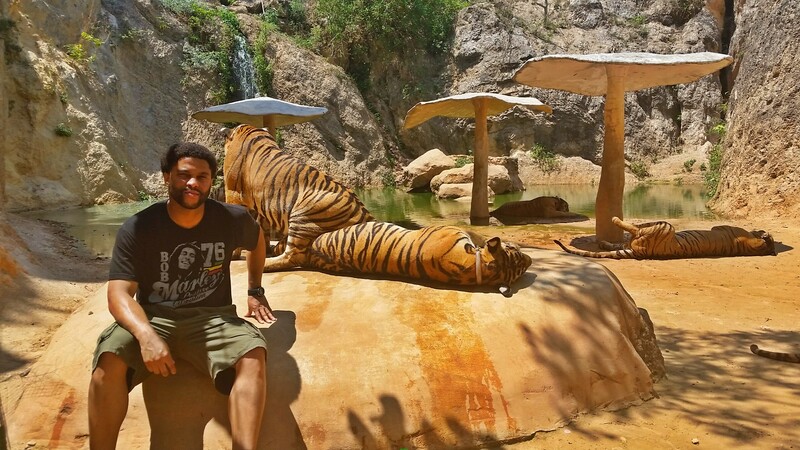 The Tiger Temple is located in the Kanchanaburi Province. 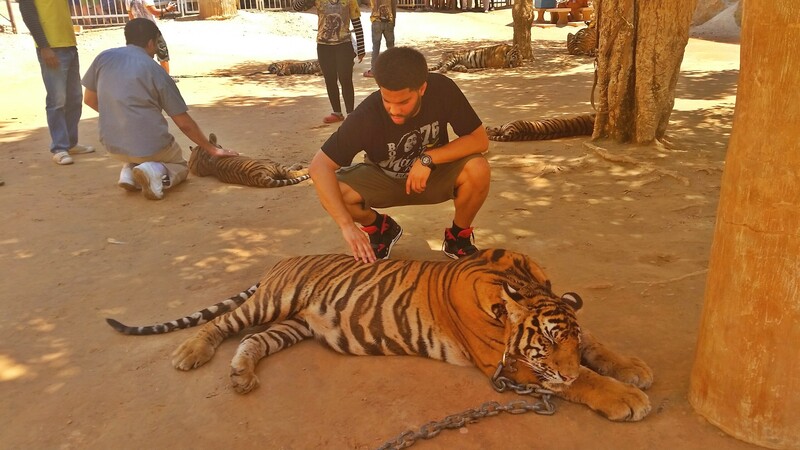 Although it is known for tigers, it is also home to a lot of other wildlife. 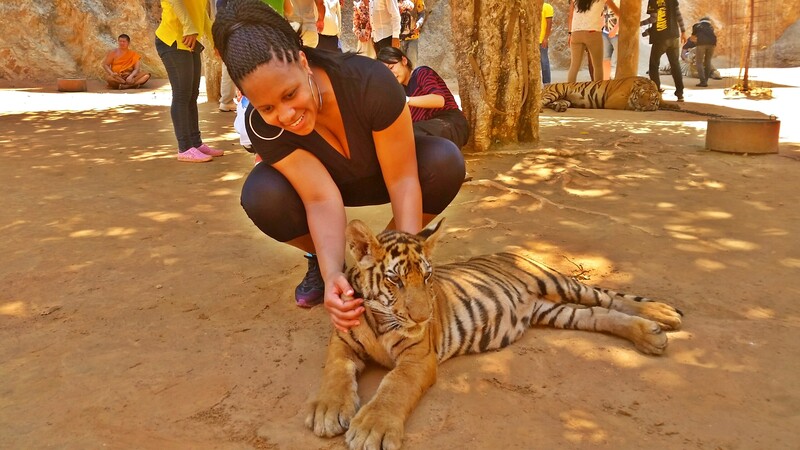 A little background on the Tiger Temple – If you are familiar with tigers, then you know that their existence is scarce; there just aren’t as many of them as there were years ago. To this day, tigers are hunted and poached for a pretty large penny. 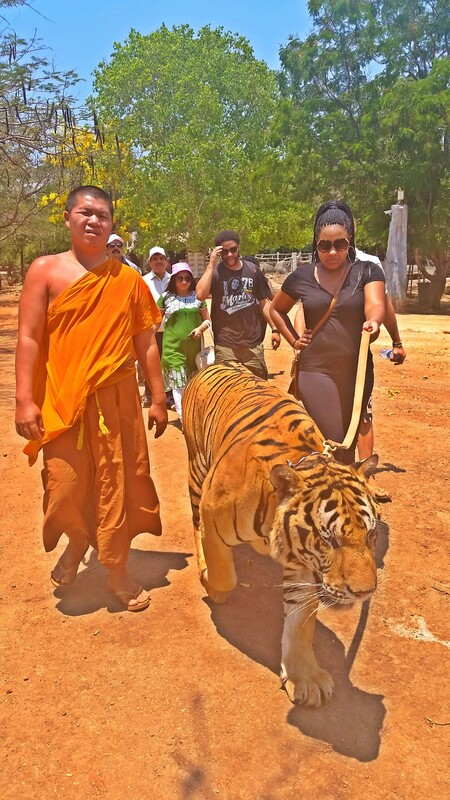 The Tiger Temple is a Buddhist monastery that not only cares for and protects endangered tigers, but also breeds them and promotes peace and preservation of life on their grounds. 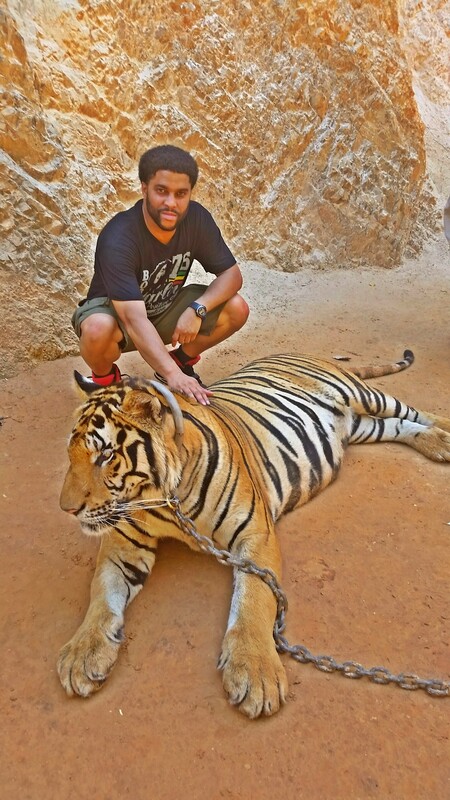 While a tiger’s lifespan in the wild is only 10 years (hella short, right?! 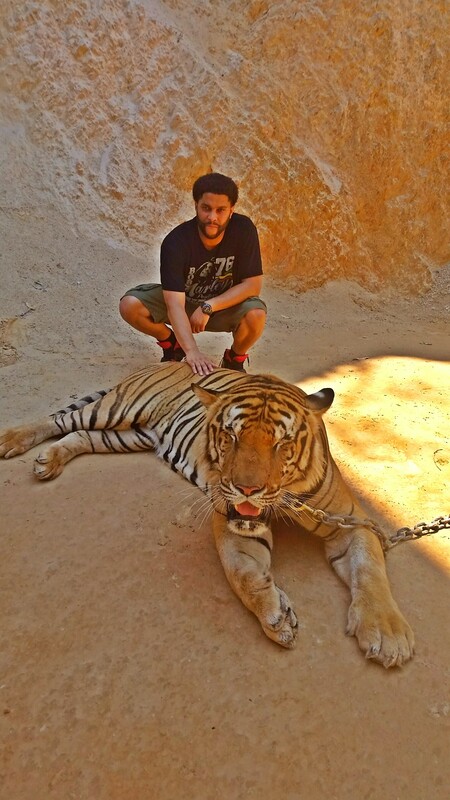 ), the tigers in the monastery live for 20+ years. These tigers were born and raised to be gentle and have never hunted a day in their lives. They don’t medicate or sedate them, and they have a huge natural habitat for them to live, play and make their home. Of course we didn’t visit the entire grounds of the monastery, only a small area. 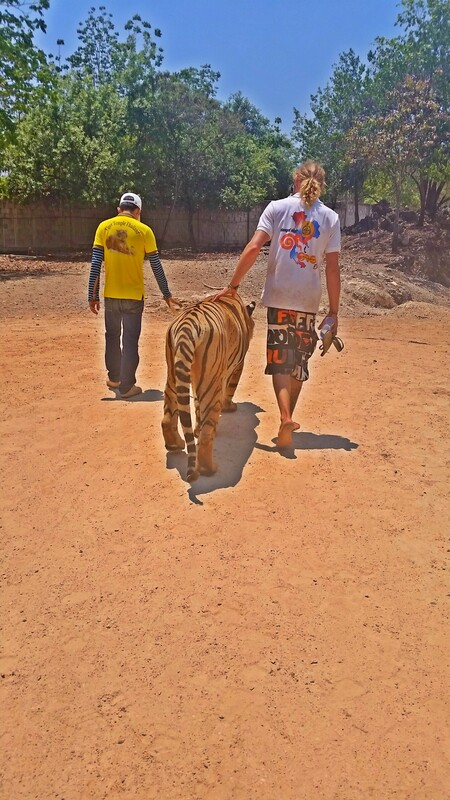 All tigers aren’t comfortable with humans and human interaction, so we were confined to a specific area and a small group of tigers (maybe 8-10) that were fine with interacting with us. When people visit the monastery they put them on chains because, at the end of the day, they are wild animals; you can never be too safe with a wild animal. But overall, they were very calm and relaxed. 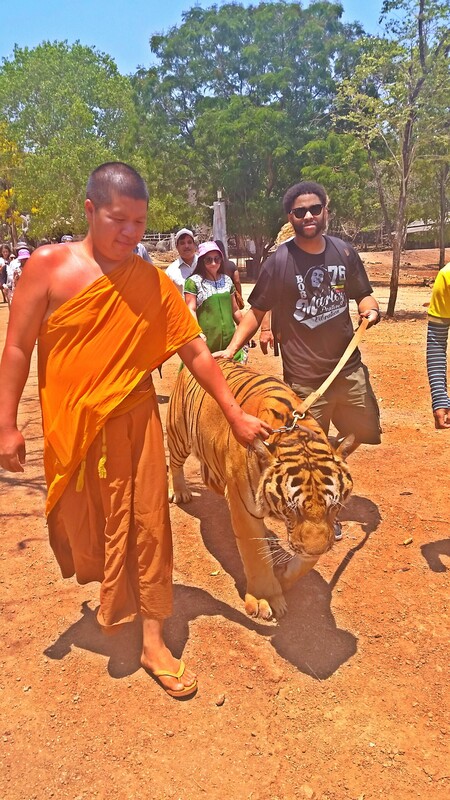 I was amazed at how the Thai people and Buddhists were interacting with them…playing with them and treating them, literally, like big house cats. 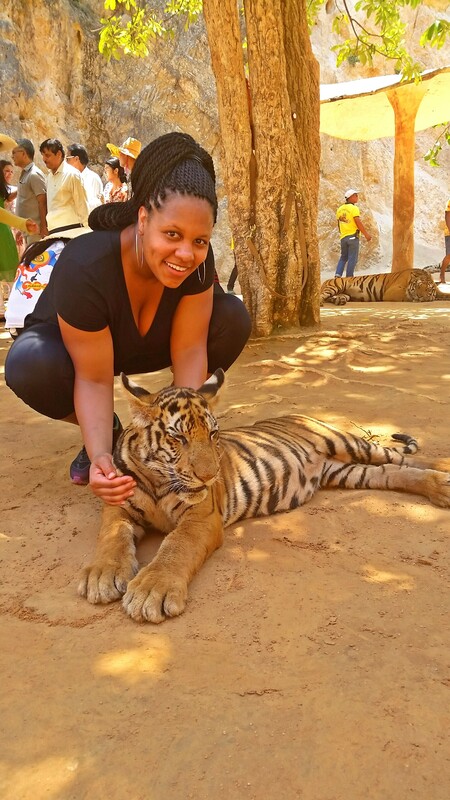 However, while on the grounds we had to take certain precautions because, as I mentioned earlier, they are tigers and they have animal instincts. I wasn’t sure how much better our day could get, but believe it or not, it got even better. 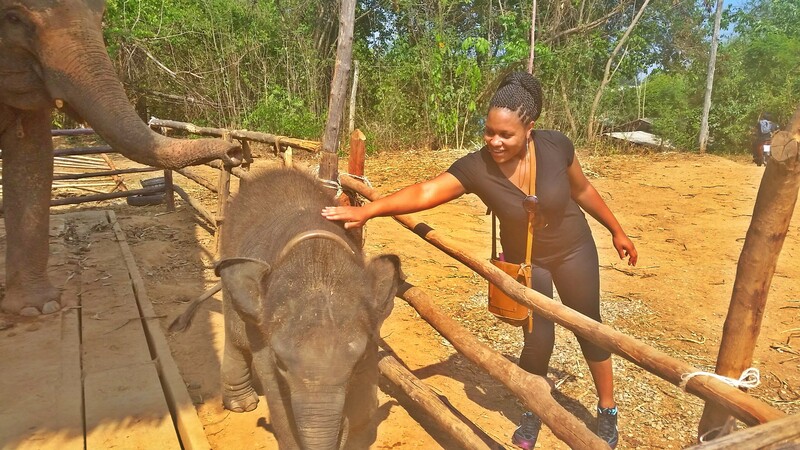 After the Tiger Temple experience we headed to the elephant park. 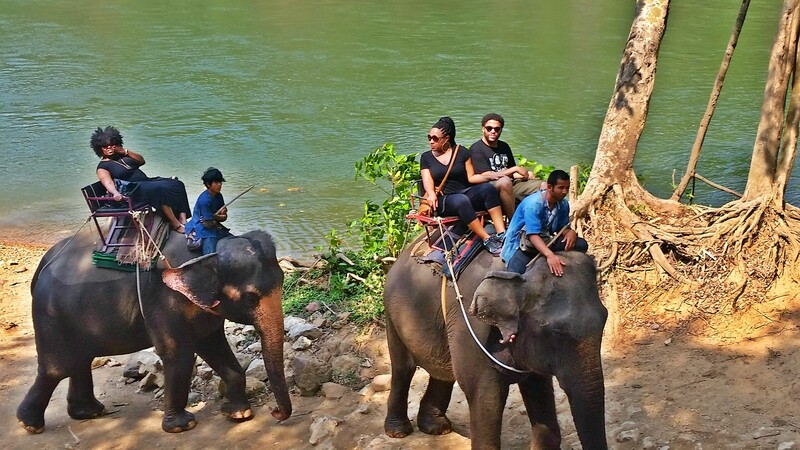 In Thailand, elephants are the most respected of all animals and still play an active part within Thai society and culture. In the past they have been used at the forefront of battles (which was evident while viewing the paintings in the temples at the Grand Palace) and in more recent times to assist in the logging trade. 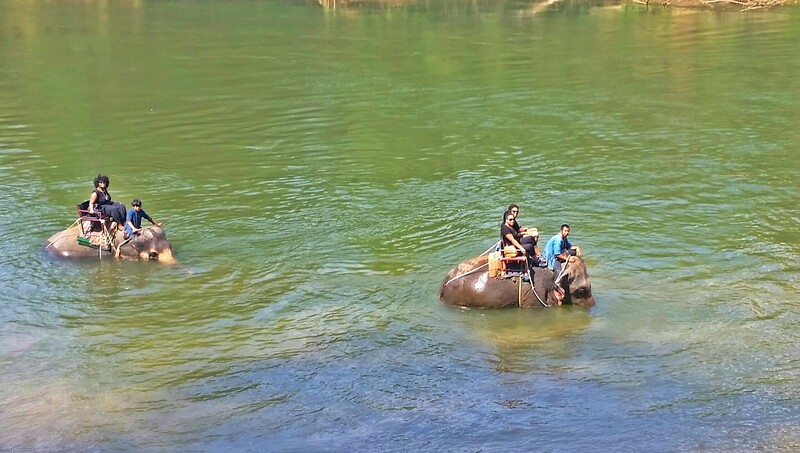 The elephant park was owned and ran by a Thai family that resided on a river; it was literally located a few feet from a huge flowing river. 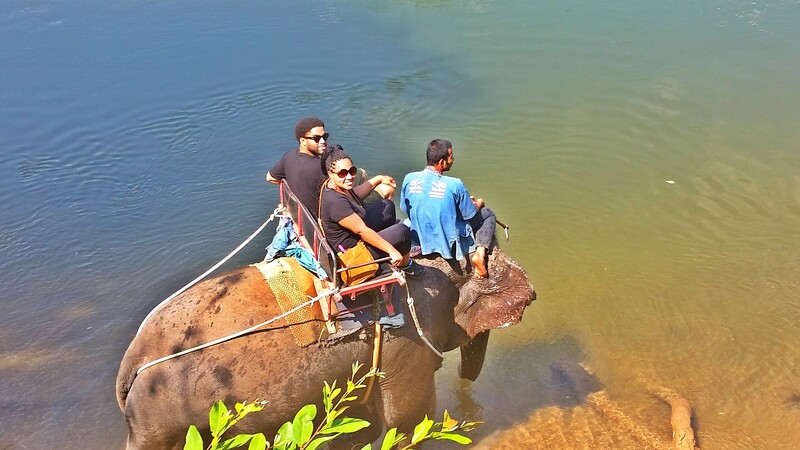 Our tour guide explained how the elephants loved living near the water. 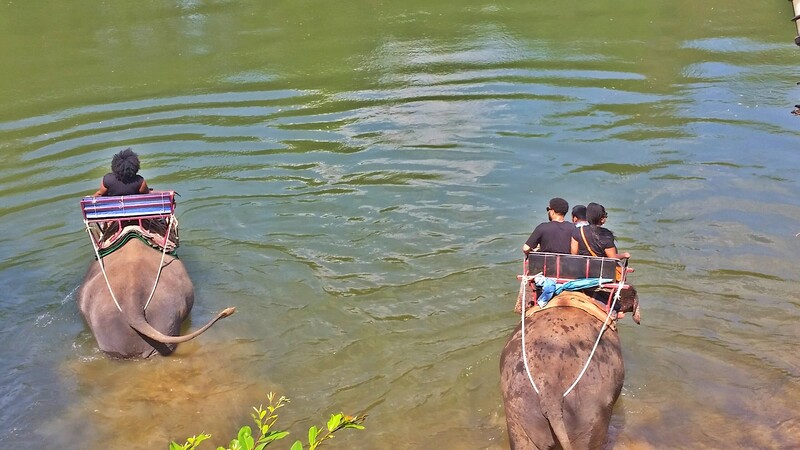 They bathed and played in the river everyday, which is perfect in the Thailand heat. 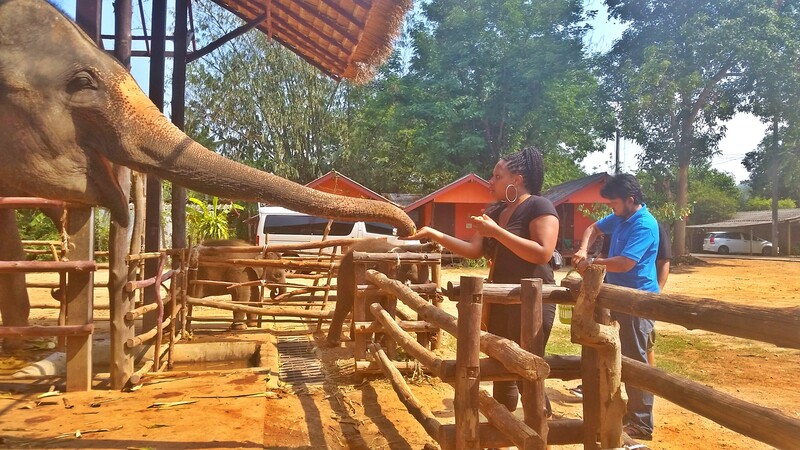 When we arrived we didn’t waste any time mounting our elephants and taking a tour of their grounds. 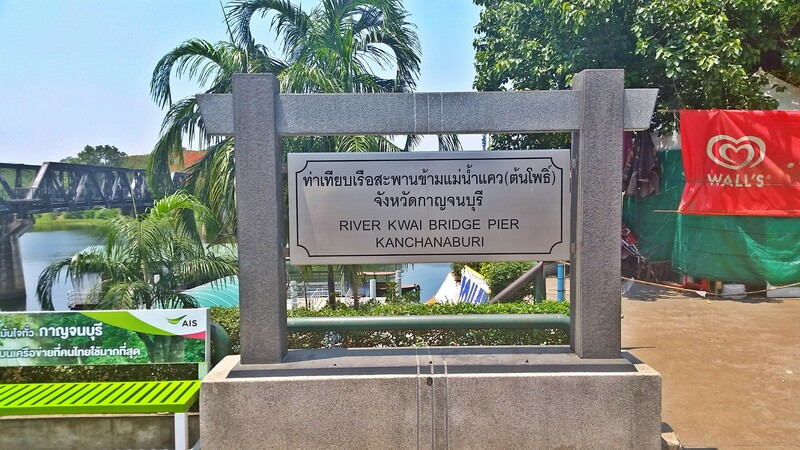 As we approached the river I wasn’t expecting us to go in but…we did! 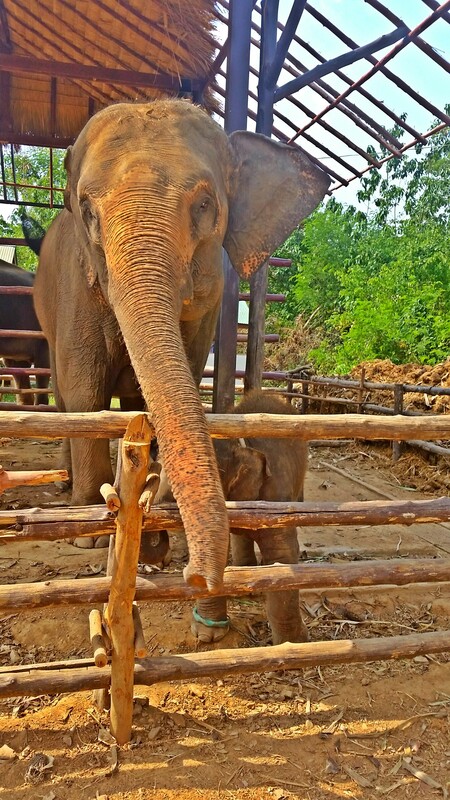 It was pretty hot out, so the elephants immediately began to fill their trunks with water and cool off their bodies (and us) with it. 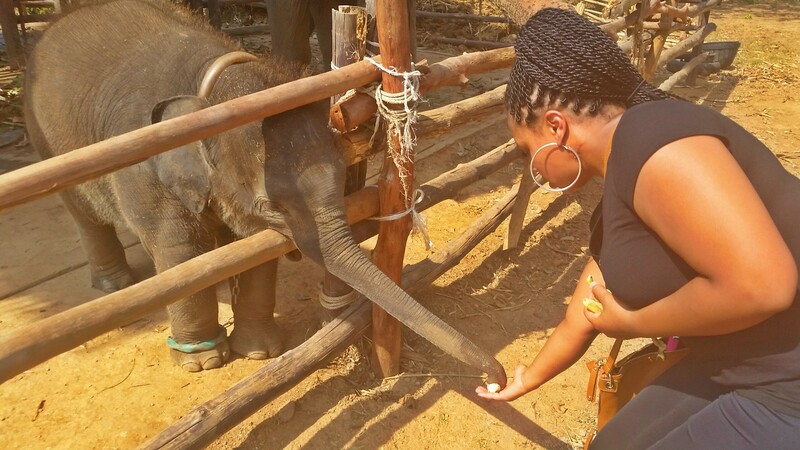 We also had the opportunity to feed the elephants, which was awesome! That pretty much wrapped up our full day excursion, and as you can imagine we were drained and tired. 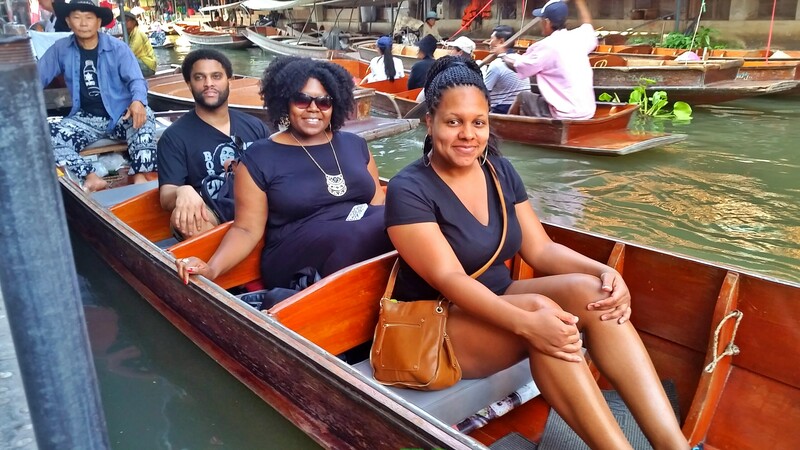 We headed back into the city that evening and was dropped off at our hotel. This particular day was, unarguably, one of the best days of my life. 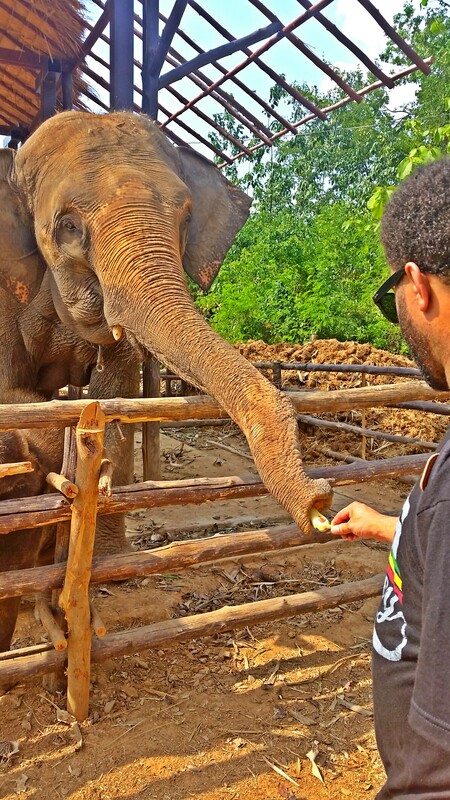 Having the opportunity to experience so much of Thailand in one day was just unbelievable. But wait, it gets better. 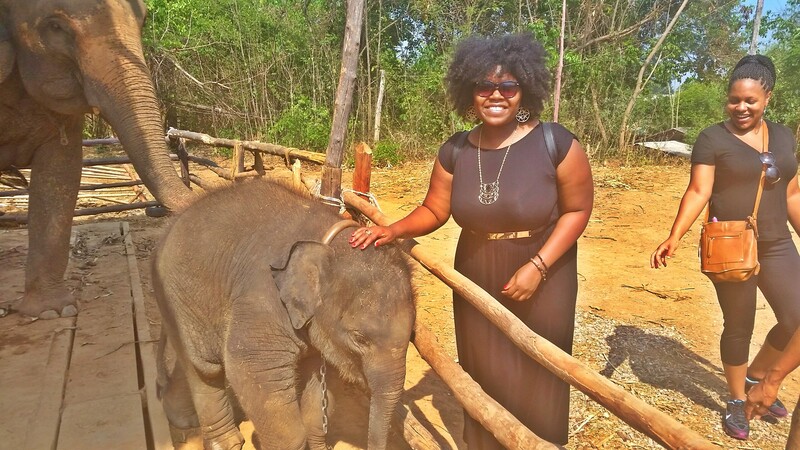 Stay tuned for part 3 of my Thailand adventure!